NUMBER 67 – At the completion of 48 hours Westbrook is at mile 85 past Parker’s Crossroads. He maintains 48th place with one other, out of the 68 screwed runners. With his last call to home he stated that his hamstring is still painful but he will try to run out the pain, knowing if it gets any worse he may not be able to continue. “it was a slow death march in the blazing sun. it was only about 100 degrees, which felt almost chilly after yesterday. for the vol staters, this was reality sinking in. a lucky few were near shelter when the storms struck. running the vol state is like boxing with your hands tied behind your back. all you can do is absorb punishment. “i am not sure when there will be another comprehensive update. until the parade at the rock begins. 2 have finished, about to be 3. 1 is in police custody. to drag themselves the rest of the way to the rock. just before noon here in kimball. so we can have another lighting and rain show this afternoon. lovely weather pattern for the runners on the road. manchester is leading at 111.
pretty sure there is a heat advisory out today. just in case they dont notice. Westbrook is hanging in there. 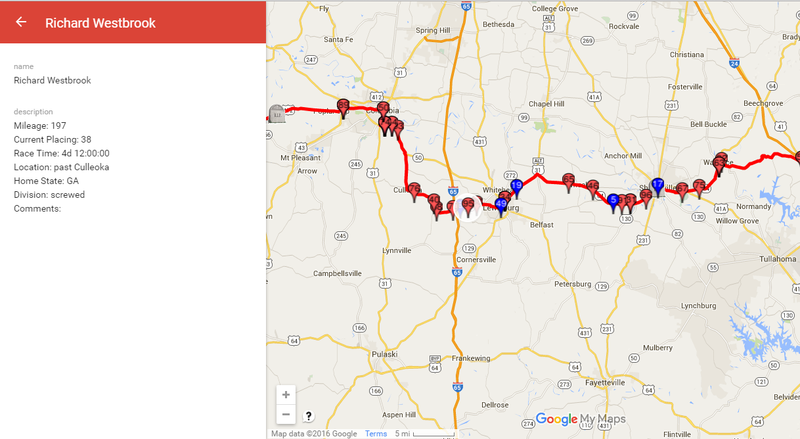 He has finished 197 miles and is past Culleoka, Tennessee. For this update he is in 24th place within the screwed division.